But from the start, physicians have guided them. 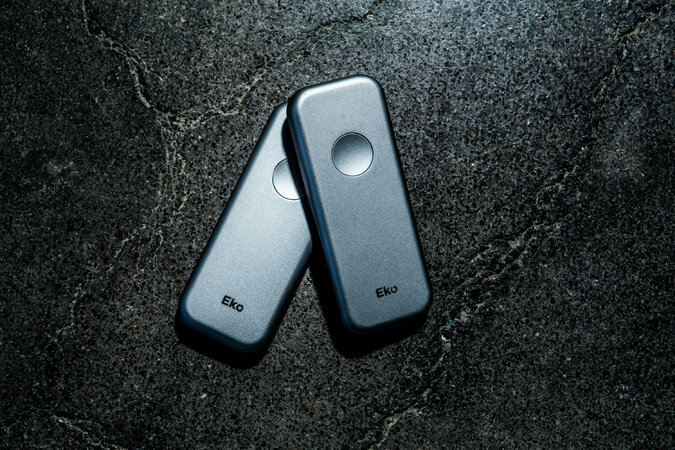 The Eko team relies on cardiologists at the Mayo Clinic, Stanford University’s School of Medicine, Massachusetts General Hospital and the University of California, San Francisco, School of Medicine. The Duo gives at-home heart patients “a cardiology-level exam” said Dr. Ami B. Bhatt, director of outpatient cardiology at MGH and an assistant professor of medicine at Harvard University. Other doctors say that it is too soon to tell how helpful telemedicine devices — which include home monitoring devices for diabetes, asthma and sleep disorders — will be, given the many obstacles. For one, patients can’t always be relied on to use them consistently or correctly. Telemedicine is a $9.2 billion business, said Bruce Carlson, publisher of Kalorama Information, a health care market-research firm in New York. The field is growing at 8 percent annually, nearly three times as fast as other medical devices. The Duo enters a competitive field. The more established Kardia Mobile, which is the size of a stick of gum and attaches to the back of a smartphone, takes an E.K.G. reading in 30 seconds. It sells on Amazon for $99. This spring, AliveCor, the maker of the device, received over $30 million in funding, including an undisclosed amount from the Mayo Clinic, which is collaborating with the company on development of its devices. The competition does not deter Eko’s founders. Mr. Bellet said the Duo could become “Shazam for the heartbeat,” referring to the hugely popular song-identification app. “If you can walk into a Walmart and find out what someone is playing on the radio, why can’t a doctor identify unusual heart sounds?” Mr. Bellet said. “Fun fact,” he added: The founders of Shazam are early investors. If Eko’s devices reach even 10 percent of its target market, Mr. Bellet said, “It turns it into a $1.2 billion company.” But there are plenty of ifs. The $350 Duo (which does not include a $45 monthly charge) is not for Fitbit aficionados. It is a prescription-only device for heart patients. From Eko’s airy Berkeley offices, Mr. Landgraf demonstrated the Duo. “l’ll just slip it under my shirt,” he said, scooping up the one-button device, which resembles a cellphone for preschoolers. He held it to his chest for 15 seconds as he watched the Duo’s iPhone app display a graph of his heart sounds and electrocardiogram, which tests the heart’s electrical activity. “I can also analyze it,” he said, clicking to another screen. “This is one of the features we’re working on.” That next step, an algorithm, will send data to the cloud, where it will be analyzed for heart abnormalities. The Eko team has discovered that medicine is not like other industries. “It’s a five-to-10 year cycle to get a product to market, because it’s so highly regulated and a slow-moving industry,” Mr. Bellet said. The Duo and other telemedicine devices address a common medical problem. “There is a black space,” said Dr. Robert Pearl, a lecturer on health care policy at Stanford University’s medical and business schools and, until recently, the chief executive of Kaiser Permanente Medical Group, which represents 10,000 physicians. Many small companies are developing devices for home monitoring, he said, “but doctors do not want continuous information.” They only want to know when there’s a problem, Dr. Pearl said. Physicians tend to want more time talking to patients and less time scanning screens — and some of them are tech averse. “Some doctors are still faxing prescriptions,” Mr. Bellet said. Telemedicine data must seamlessly reach patients’ records, which is something he and his partners are working on, he said. And insurance companies must agree to reimbursement, another work-in-progress. “They should be held up to the same level as drugs, because there are always unintended consequences,” he said. The market potential for products that address heart failure is great. The Centers for Disease Control and Prevention estimates that 610,000 people die of heart failure in the United States every year, making it the leading cause of death. Half of heart-failure patients who leave a hospital return within six months. They keep tabs on themselves by weighing themselves daily, looking for sudden weight gain that can mean water retention — a sign the heart is not functioning properly. The Duo received clearance in May from the Food and Drug Administration, and the new device will ship in the fall. Over the next two years, the company will participate in two studies at U.C. San Francisco. Charvi Shetty, a Berkeley classmate and friend of Mr. Landgraf’s, has followed a similar path as the Eko Devices team. For her senior design project in bioengineering, she built a device for asthma patients. Five years later, she is chief executive of Knox Medical Diagnostics, a San Francisco start-up that has developed a device for children with asthma to monitor their health at home, sending results to a smartphone app. She said her device, called the Aeris, replaces the commonly used peak flow meter, which she said, “doesn’t show what’s fully going on in children’s lungs.” Her product is undergoing testing at the U.C. San Francisco School of Medicine, where the pediatric pulmonology department is helping with development and funding. Ms. Shetty’s device is a portable spirometer that measures airway obstructions and the severity of inflammation in a child’s lungs and, she said, alerts a parent before a child has an asthma attack. More than 8 percent of children in the United States have asthma, according to the C.D.C. While they are a fourth of all asthma patients in the nation, a study conducted in 2010 found that children make up nearly a third of asthma patients who are hospitalized annually. After testing her device with asthmatic children, Ms. Shetty added a video game to the app, to encourage young patients to use the device effectively while keeping them engaged. “Some 6-year-olds are able to understand better what’s going on with the app than the adults,” she said. In November, the Aeris will become available for research purposes, she said, for $99 plus a $10 monthly subscription for the mobile application. She expects to seek clearance from the Food and Drug Administration later this year.